Hey all, and welcome to what I hope is the first of many posts for the Grassy Gnoll. 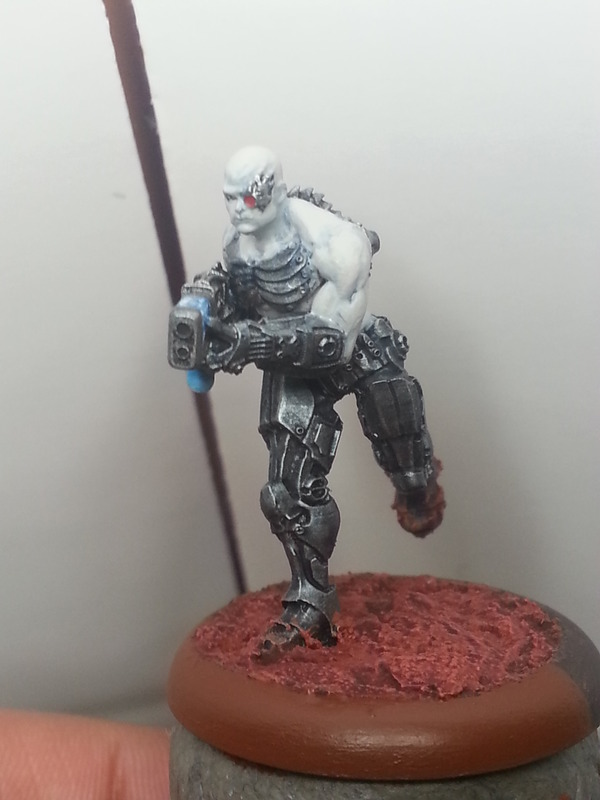 I’m Evan, and this month I’ll be running through the process of painting Cybertronic Chasseurs from Warzone Resurrection in a Martian/Frontier colour scheme. For anyone unfamiliar with it, Warzone Resurrection is a miniatures wargame based on the Mutant Chronicles RPG setting. Some of you may be wondering “Evan, why are you using this colour scheme if your basing theme is Martian landscape?” Well, dear reader, I’m painting it like this because I like schemes with a stark contrast to them. For example the blue-steel of the armour plating and gun casing works well to contrast and tie together both the pallid and sickly looking pale flesh of the Chasseur and the earthy rich red-brown of the Martian hinterlands my various armies will be fighting over (You’ll see a terrain guide for building a similar set up in a future update). Should I have gone for a red-metal look for my armour? Yeah, probably. But I think this scheme also works well to reflect the cold and calculating approach to warfare that the Cybertronic Megacorporation exemplifies so well. To sound less wanky. I think it looks dope and fits the faction’s image and theme nicely. As long as your own schemes fit that criteria (looks good, and suits the faction) I say go nuts. I primarily use the Citadel Colours range of paints and washes and brushes from Games Workshop. If you use other brands it shouldn’t be too hard to figure out and match what colours I’m using, but I’ve included a list of colours used and their equivalents between the ranges at the end.